When I was at the farmer’s market today, I noticed the first peaches out. What a golden time of the year we are entering as the bounty of fruits and vegetables captivate us with colour, scent, and flavour! 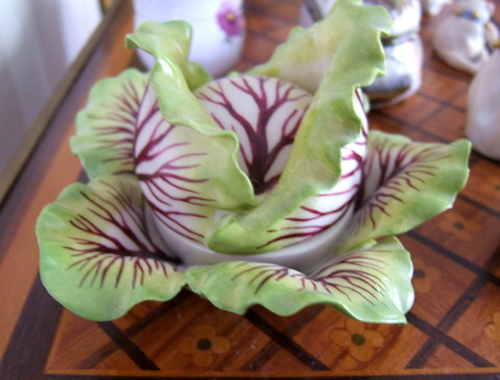 This got me thinking about porcelain produce, that is not to be eaten, but simply to look at and admire. In the beginning of the 18th century, the medium and artistry of porcelain caused a sensation when the formula was newly discovered at Meissen, Germany. The race to discover the formula of porcelain, or white gold as it was known, is a fascinating story wrought with treachery, bribery, murder, deceit, violence and tragedy. Prior to this, the only porcelain available was shipped from the orient with much difficulty and at great expense. In this period, the height of prestige and elegance was to drink tea from porcelain cups imported from the orient, or at the beginning of the 18th century, from cups made of Saxon porcelain from Meissen. Many Royal houses began their own manufactories that exist to this day, such as Meissen, Nymphenburg, Derby, and Sèvres. Because porcelain was a new medium, an air of inventiveness, whimsy, and charm is evident in many of the creations. Pieces were often incredibly detailed without concern for breakage or technical limitations. Porcelain firing was an unpredictable, difficult, and costly endeavour, and minute flaws such as glaze pops or firing cracks were often charmingly concealed with small ladybugs, insects, snails, or floral sprays. Table decorations and services of the rich and aristocratic were often decorated with pieces of porcelain that mimicked actual foods. Among these were tureens modelled as cabbages, tureens with lemons as finials, and plates formed as leaves with stems for handles. 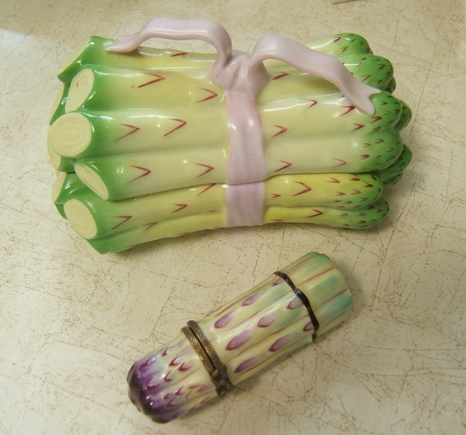 Porcelain vegetables such as bundles of asparagus or a melon were modelled as small tureens, saucières, or simply as decorative accents. The antique models by Bow, Chelsea, Meissen, Mennecy, Worcester, and St-Cloud are prohibitively expensive and a lot of sleuthing is necessary to track them down at auction houses such as Drouot, Christie’s and Sotheby’s. But perfectly lovely examples exist in the modern day porcelain creations of Dodie Thayer of Palm Beach, Herend, Katherine Houston, Penkridge Ceramics of England, and Vladimir Collection. The prestige manufactory of Meissen will possibly re-issue special edition models based on 18th century originals, but be warned, they are limited and prohibitively expensive. If you are at all creatively inclined, you can even make your own. I’ve made a few myself at a ceramics studio. Start with a little blush coloured crab apple or a peapod…really very simple and fun to do. 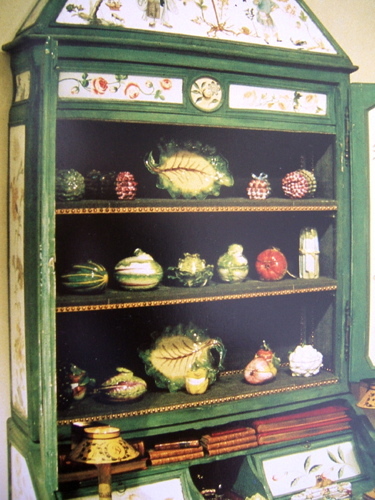 This entry was posted in Elegantology and tagged Bow, Brigid Berlin, Chelsea, Dodie Thayer, Duchess of Windsor, Elsie de Wolfe, Gaylord Hauser, Herend, Katherine Houston, Lady Mendel, Mario Buatta, Meissen, Mennecy, Nymphenburg, Penkridge Ceramics, Royal Crown Derby, Royal Worcester, Sèvres, Sister Parish, St-Cloud, Vladimir Collection. Bookmark the permalink. I love cabbage, real, painted and needlepointed. There is something so regal about a cabbage. Wonderful post. I think I need to collect some of my very own…. 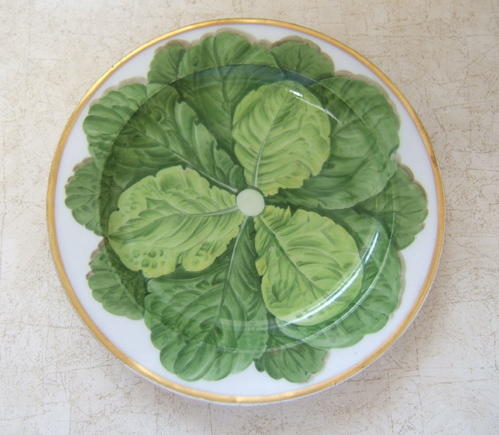 Wedgwood produced a lovely white china pattern with a raised impression of cabbage leaves. Very English country–one of the few pure white chinas available. Sets a charming table, very understated, and the accessory pieces are beautiful shapes. Unfortunately, Wedgwood is no longer produced in England. Ornamental cabbage is a must for city gardeners, and I love it in a stone pot or urn combined with variegated English ivy. Your post is a fine tribute to a simple vegetable! I especially admire the Meissen plate! Great post with lots of beautiful images and ideas. They are so beautiful. I love them all. Thanks for posting those pictures. Hope you had a great weekend. How delightful these porcelain beauties are! They grace any table and it proves that any kind of nature be it food or flora can be graceful in bone China. 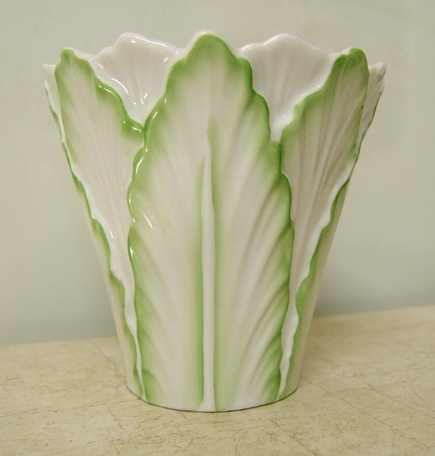 Love these — I’ve always been attracted to leafy porcelain. Thanks for the great images — particularly the cabbage boxes. Reggie, it’s all thanks to Square with Flair. He knows his stuff. I learned a lot, too! 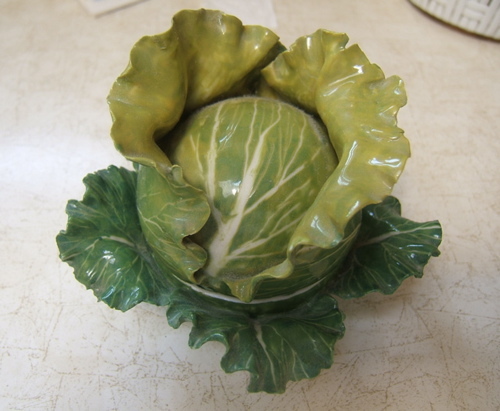 I recently picked up a a porcelain cabbage by Didier Gardillou from Galerie Maison et Jardin in Paris. I have investigated the resources mentioned above, but I cannot find anything comparable. Any other suggestions for resources?